That’s it. It’s over. The end. As of today, the McLaren P1 road car is a car that McLaren used to make. 375 production examples have been built, and no more for the rest of time. It’s hard to eulogize the McLaren P1 with out getting all maudlin and sad, but the truth of the matter is that I love this car. With its death, it’s marks an end to an incredible era for ultimate supercars. 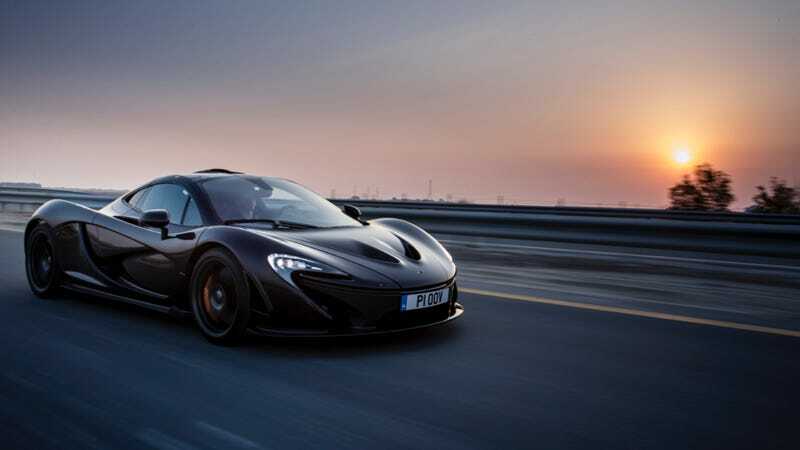 Along with its main competitors, the Porsche 918 and the Ferrari LaFerrari (which still has a dumb name and which pains me every time I write it), the McLaren P1 didn’t just happen to be developed at the turn of the 21st century, it was a car that set the standard for a new century. Of those three hybrid supercars, the P1 is my favorite, from its sloped nose to its positively alien tail, all slithery lights and monstrous fans peering out from behind their metal curtains. It was full of incredible technology that added, rather than took away from the driving experience. It mashed together twin turbos, a V8, and a hybrid electric motor to make a truly ungodly noise, along with 903 horsepower. From the moment we first heard it, we were in love. That purely brutal sound – all traditional combustion, forced induction, and electric whine lovingly layered together like the fastest and most delicious cake in the world – combined with advanced engineering and whiz-bang technology brought us a car that weighed just a hair under 3,200 pounds, could get you to 124 miles per hour in 6.8 seconds, and could rocket you onwards to a top speed of 217 MPH. Each car took 800 hours to build, and involved 105 different people. It took five days just to paint one example, the most popular color being Volcano Yellow. 34 percent of those 375 cars went to the Americas, according to McLaren, with the next largest market, Asia, comprising 27 percent of the total. McLaren built 21 cars for development (13 experimental prototypes, five validation prototypes, and three pre-production cars), but those aren’t being counted towards that 375 figure, as they were thrashed for 385,250 miles, in everything from absolutely freezing arctic temperatures to searing Arizona heat. Not to mention all that track work. There are a few more McLaren P1 GTR track cars left to finish, but this is it for the road-going version (though some of those GTRs might be converted to road use, though not by McLaren). The first McLaren P1 was painted silver, and the final has been painted a beautiful pearlescent orange, reminiscent of McLaren’s traditional colors. McLaren will surely build a successor, and that will be a time to rejoice. But for now, I’m sad. The P1 was a beautiful, powerful, purposeful work of art, and for that, we should be grateful.